I really like this one, since there was more characters to relate to. You had the three sisters: Rowan, Kestral, and Jade (Ash’s sisters that were mentioned in the first book). Then you had Mary Lynette & her brother. There were also some minor characters that you get to see a little bit of. Plus they talk more about the Nightworld, which was cool. I liked that each of the different….hmmmm…species? of Night Worlder is represented by a different black flower. You, know so that that can identify themselves. 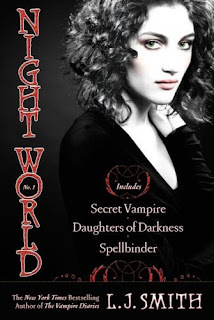 In here, I noticed the same continued theme from many other vampire & werewolf novels. They are mortal enemies and will start growling and hissing at each other…very dramatic. Anyways, so Mary Lynnette is human….ahem….and she loves the nightlife. She is obsessed with astrology and just being part of the darkness. She lives in some small, I mean really small, town. This town sounds like it makes Forks look like a metropolis in comparison…and that’s saying alot! Mary Lynnette’s mother died a few years prior and she really has no friends at all, everyone thinks she’s weird. Jeremy is one of the only ones who understands her. Then her nearest neighbor, this old lade named Opal, tells her that her three nieces are coming to visit, and Mary Lynnette tries to play matchmaker with her brother, before the girls even show up. Mark is not having any of that. When the three sisters show up, they start out with a bad run in with some town bullies, which doesn’t end too great for the bullies. Shame on them anyways for trying to do those mean things anyway!! But when they get to their Aunt Opal’s house, they find her dead…..staked. So they know that somebody knows that Aunt Opal was a vampire. So they decided to bury her. Because no way they could explain away her death, since the woman now looked like a mummy…which is what happens when vampires get staked. They go to bury her in the backyard and don’t realize Mary Lynnette has seen them, since she is far away using her telescope when she sees it. This is funny though, I mean she then tries everything she can to find a way to get into the gardena and see if it really is Opal over the next few days. Meanwhile, Mark has sorta “imprinted” (not the word fromt his book) with Jade. They are soulmates. Another layer of issues for everyone to deal with. Then Ash shows up. With his bad boy, dangerous vibe. And he color changing eyes. Yummy. He goes to Mary Lynnette’s house to try and find out about what everyone knows. Ash is very much a “Vermin Hater” and only toys with humans. Which was mentioned in the last book…not to mention he tried to have his cousin’s girl killed for it….tsk tsk. But when he and Mary Lynette meet…BuZzZ!!! It’s like electricity in the air and it almost hurts for them to touch. Ash knows what it means and doesn’t like it. He has now found his true SoulMate in a human. Eventually, the sisters learn that Ash is in town, and since they ran away and broke NightWorld laws…they are in serious trouble. Not to mention, they have figured out who killed Aunt Opal. So this motley crew of misfits decides to put more effort in to finding out who did it, to save all of their lives. I really liked this book. It didn’t have a very happy ending. It kind of left you hanging, which after reading Stephen King for years, I have gotten used to. I don’t like it, but it happens. And with about 7 more books in this series to go, I have hopes that Ash and Mary Lynette will figure things out and make it all work out for the better. I don’t think I am going right on to the third book in the series yet. It isnt really calling to me yet. So, I started a different book. Completely away from the vamps and wolves….away from the supernatural all together. No, this one is about murder and suspense. And I loooovveee a good suspense book….especially if it has some romance it in as well. Here’s to hoping it does!! LoL. Until next time: Happy Reading!! !